Consistency in procedure. Consistency in taste. Consistency in quality. Cook Chill delivers on all these points and is easily scalable to any size food prep kitchen or production area. Cook Chill is often referred as a "prescription" for freshness and quality, as it allows foodservice operators to maintain absolute control over uniformity with precisely measured recipes, and carefully monitored cooking cycles. This process assures uniform flavor, texture and quality. Best of all, even after weeks in storage, the foods taste as if they were freshly prepared. So, what exactly is Cook Chill? Basically, any food of pumpable consistency can be cooked and prepared at peak quality with the Cook Chill System. This includes soups, chowders, sauces, gravies, gelatins, chili, stews, casseroles, pasta dishes, pizza toppings, and many more. Foods are cooked, bagged, quickly chilled, and stored for later use. From large food production kitchens using industrial sized cooking kettles, to single location restaurants, Cook Chill works equally well for any size and need. 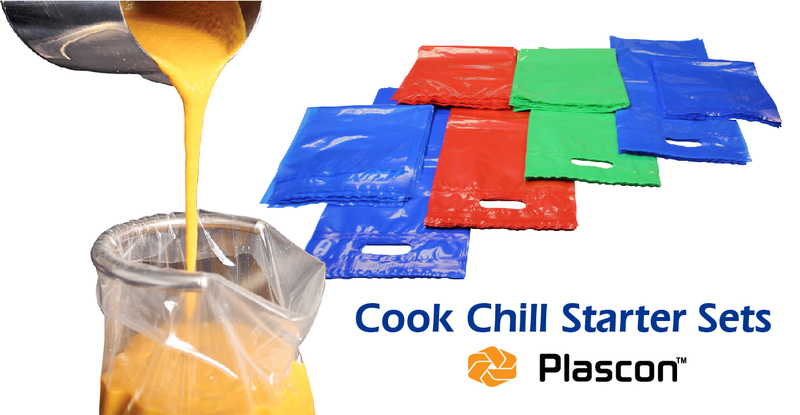 Plascon manufactures cook chill bags in our blown films plant using a 7-layer co-extruded film for optimal durability and performance. The seven layers are extruded simultaneously at the time of production, resulting in optimized quality and strength of film, and are made with oxygen and moisture barriers to provide better flavor protection. 7-layer film has long been the standard for high abuse applications such as a cook chill tumble chill, or thermal shock, and provides superior protection against leakage when storing and transporting bags filled with food ingredients. The unique, multilayered film also prevents crossover of flavors or odors in distribution. The foods are packaged at above pasteurization temperature, and not exposed to air until the bag is opened for serving. Plascon Cook Chill Bags work equally well for refrigerated or frozen foods by withstanding temperatures ranging from -20 F to 212 F.
When perfectly done and still above pasteurization temperature, food is filled directly into bag to ensure strict sanitation. Bag is then securely closed with a heat seal system or clip closure. Hand or foot-operated sealers are available. The sealed bag is immediately chilled to arrest the cooking process and lower core temperature to 40º F. Chill with an ice bath or a tumble chiller. Filled bags are stored and/or shipped refrigerated or frozen. The lightweight, durable bags stack easily minimizing storage space and shipping costs. At serving location, product can be reheated in a steamer, immersed in hot water or the bag may be opened to empty contents into a kettle or serving pan. Aroma, taste, texture...the final presentation delivers quality, ‘fresh cooked’ goodness. Whatever the size of your operation, Plascon has the bags, equipment, accessories, and superior industry knowledge to help you develop a new, or support an existing cook chill kitchen. Our sales and customer service are available to answer your questions and to customize your orders to meet your exacting needs. We stock many common sized cook chill bags, but as manufacture, can also offer custom orders for size, as well as different colored film options, which can be beneficial to identify specific food items in storage. How do you get started with Cook Chill? Request our Cook Chill Starter Set and you can start perfecting this method of food prep and serving right away, at a price that is affordable to even smaller single location restaurants.